SUBHEAD: Shouldn't Hawaii be monitoring Pacific Ocean and atmosphere to set baseline for Fukushima radiation? Image above: GoogleEarth used to demonstrate simulation of Cs137 distribution by Pacific Ocean currents. 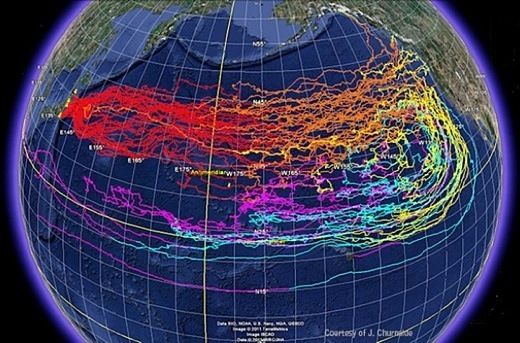 From (http://fukushima-diary.com/2012/05/does-radiation-travel-across-the-sea/). Manhattan Beach, CA Patch, Jan. 13, 2014: Cal State Long Beach researchers will monitor the state’s kelp forest for radioactive contamination from the meltdown of the Fukushima nuclear power plant in Japan, it was announced Monday. Traces of radioactive iodine from the March 11, 2011, earthquake, tsunami and meltdown were detected about a month later in kelp along the Orange County shoreline. Steven L. Manley, CSULB biology professor an expert in marine algae and kelp (Emphasis Added): “The California kelp forest is a highly productive and complex ecosystem and a valuable state resource. It is imperative that we monitor this coastal forest for any radioactive contaminants that will be arriving this year in the ocean currents from Fukushima disaster. I think every inhabitant on earth is, knowingly or not, concerned by the Fukushima's disaster. The effects of high level radiations are health hazardous for generations since it affects the DNA chain. We must act to preserve our environment and urge our governments to promote alternative energy sources.